Kind, compassionate, diligent and loving are some of the words used by speakers, to describe Musa Williams (47). How he performed his duties at work, and his activism fighting for the rights of LGBTI and HIV positive people. 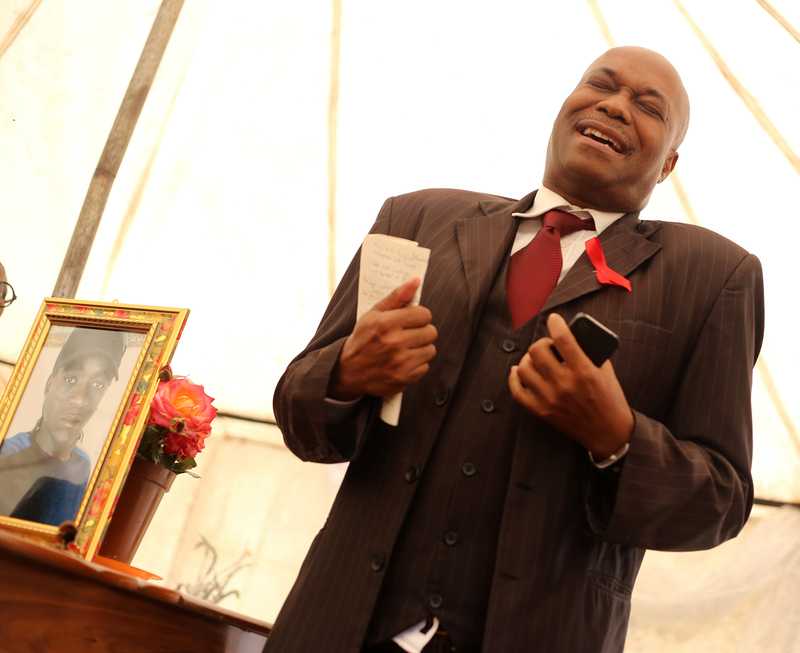 They were talking during his funeral on Wed. October 15, held at his home in Kwa-Thema, where he died suddenly a week before. 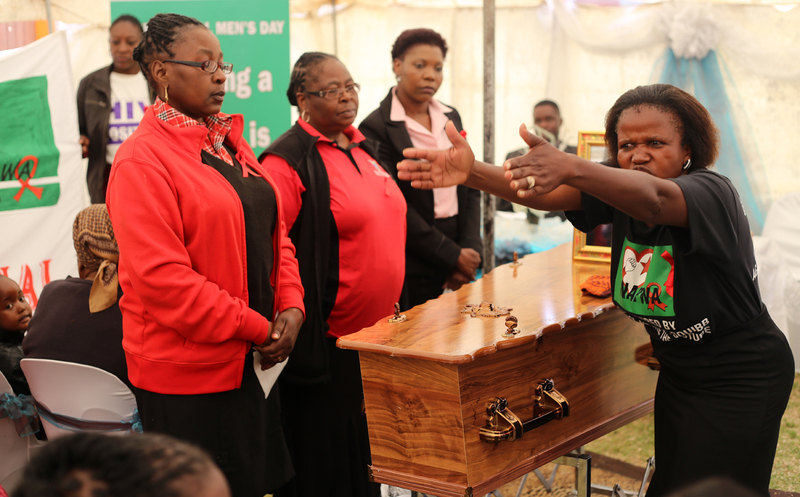 The funeral service started with less than 10 people, who sang in the lounge where Musa’s coffin stood. People were then given an opportunity to view him for the last time, before moving to the tent where the full program was carried out. Fani Masemula was first to talk, speaking on behalf of the family. He said they were saddened by Musa’s passing, but realised it is the community he helped that has suffered the biggest loss. 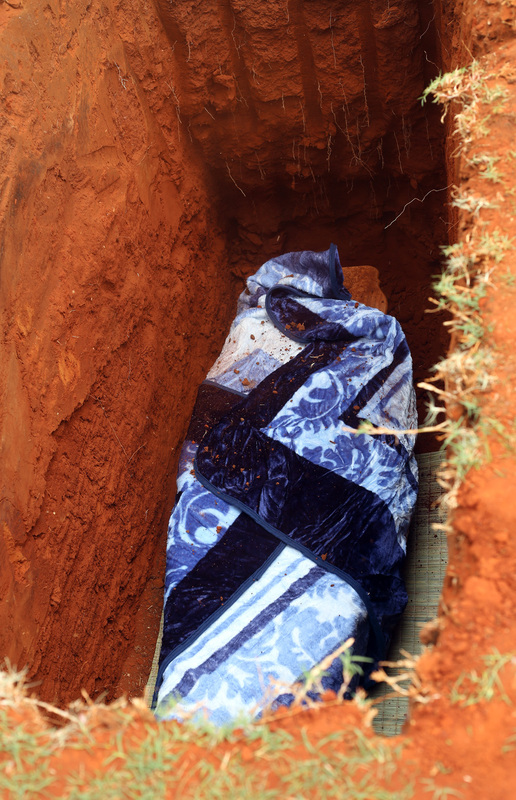 Next on the program was a neighbor Sibusiso who said, Musa was a brother and a friend to him. He added that Musa taught him how to handle tough times, and Musa’s passing is his first test at handling such a situation. Nontyatyambo Makapela shared memories of Musa, when he joined them in establishing TAC in KwaThema. How he used his own resources to mobilize people, even though he was part of the National Association of People Living with HIV and AIDS (NAPWA). She said that was testament of Musa’s passion in helping those affected by HIV in his community. Just like the meaning of his name, Nontyatyambo said she saw him practice kindness in other people’s lives. “Musa had characteristics of a leader, he was able to save many lives and prove that HIV doesn’t kill, but societal stigma does,” she concluded. Sevi spoke about how they were together with Musa burying another friend and activist Manku Maduwane just last month, not far from Musa’s home. 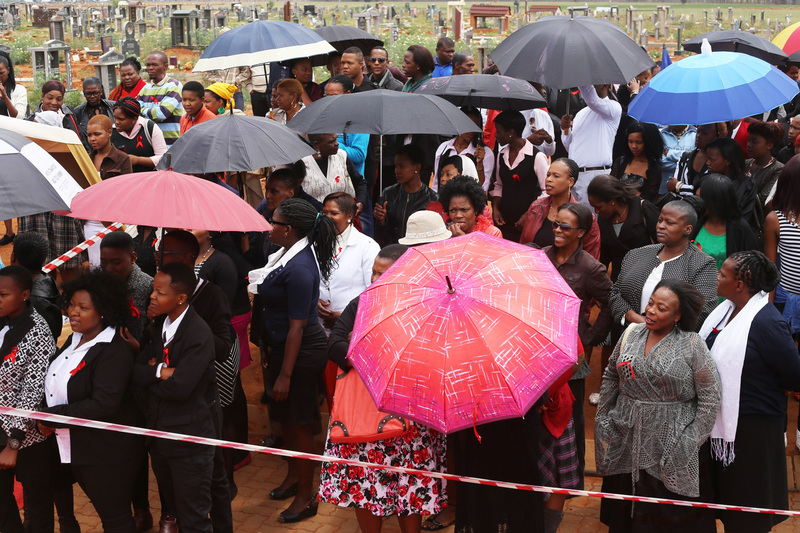 With the funeral service at home wrapped up, mourners then proceeded to Vlakfontein Cemetery. 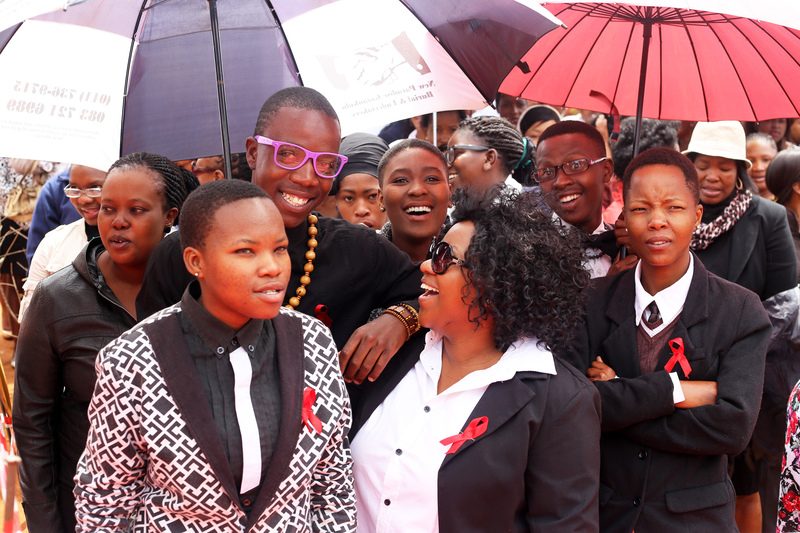 Members of the LGBTI community, HIV activists and colleagues he worked with as community health care workers, marched some distance in front of the hearse singing. There was a slight drizzle, which looked threatening when mourners arrived at the cemetery. However this did not disrupt the smooth service, as the sun soon came out shining. 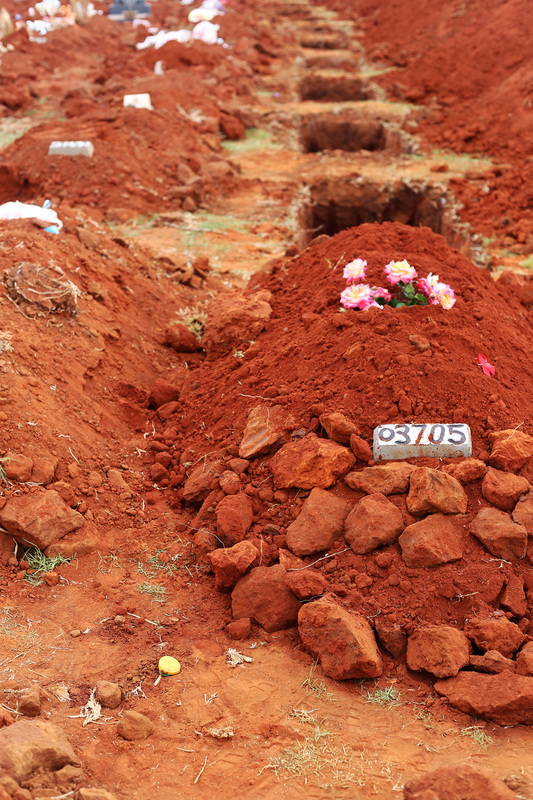 While some worked hard with spades to cover Musa’s grave, others continued singing, saying their final goodbye to a man they called IQHAWE! This entry was posted in 1967 - 2014, 20 Years of Democracy, Acceptance, Acceptance speeches, Act, Activism, Activists, Advocacy, Allies, Alternative family, Article by Lerato Dumse, Before US, Before You, Black, Body, Bonding, Bringing photography to the community, Career, Caring citizens, Celebration, Challenging the un-African homosexuality, Characters, Chief mourner, Claiming, Claiming blackness, Claiming mainstream spaces, Coffin, Collaborations, Collectivism, Commemoration, Confession, Connected souls, Connections, Consideration, Contributors, Conversation, Counseling sessions, Crea(c)tive senses, Creating awareness, Cultural activists, Death, Delegation, Democracy, Description, Dignity, Discomfort, Discussion, Education, Ekurhuleni East Counsellors, Elegance, Emotional support, Empowerment, English, EPOC lgbti, EPOC on Inkanyiso, Evidence, Exchanging Queer thoughts, Experience, Expertise, Exploration, Exposure, Expression, Facilitators, Families and Friends, Family, Family loss, Family support, Farewell, Fashion, Female Photographers, Friendships, Funeral costs, Future, Gay, Gender distinction, Gender expression, Generations, Gratitude, He(ART), Healing, Health, Health bodies, Health matters, Heartbreak, HIV activist, Human rights, Hurt, I am not the only one, I am Somebody, I can't do it ALONE, I love photography, I use CANON, I was (T)here, I was here, I-N-K-A-N-Y-I-S-O, Ignorance, Inkanyiso media, KwaThema, LGBTI losing another informed activist, Life lived, Members of NAPWA, Musa Williams funeral, Not a hate crime death, Pain, Pastor Tebogo Moema, Photos by Lindeka Qampi and Zanele Muholi, Questioning, Questions & Answers, Real, Reason, Recognition, recognized, Records and histories, Supporters, Supporting each other, Supportive friends and families, Warmth, We Are You, We Care, We love photographs, We Love Photography, We were (t)here, Well organized funeral, Women's power, Words, Writing is a Right, Years. Bookmark the permalink.